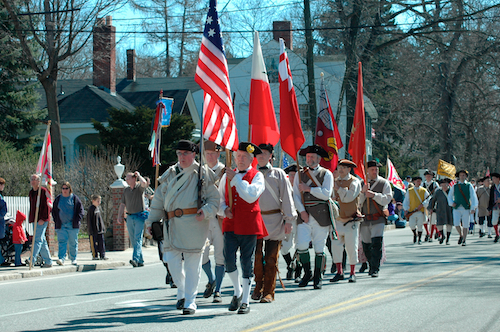 Bedford Minuteman Company a photo by carltonsoohoo on Flickr. The Virtual American Revolution is an educational multimedia project that aspires to show everyone what American Revolutionary War locations look like today. In some cases, the landscape has changed drastically from when our country’s forefathers declared independence from King George’s England in 1776. Shopping malls and neighborhoods sit on top of key locations while in other more remote locations, the grounds are not changed much. This project began with a conversation that I had with Everen T. Brown, back in 2005, at the October meeting of the International Virtual Reality Photographers Association. Everen is a fellow 360-degree panoramic photographer and he was speaking about his 360-degree World Atlas project. I approached him after his talk and he asked me what virtual tour project I was willing to start. At that time, I had been thinking about creating a virtual tour of the locations in Lexington, Concord, and Boston, to show “where it all began”. Fortunately, Everen challenged me to think even bigger and to do the entire American Revolution locations. In hindsight, I would have expected nothing less from a photographer who had travelled all over the globe, and surely, I could just travel up and down the east coast of the USA.